Tangle-Trap® Sticky Coating | Gardens Alive! If you grow apple, pear or plum trees, you probably already know what a nuisance the apple maggot fly can be--the larva of this fly burrow into the fruit and make it inedible. Want to trap apple maggot flies before they ruin your harvest? Let Tangle-Trap® Sticky Coating come to the rescue! 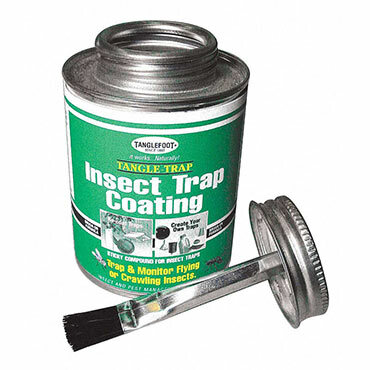 Simply brush the coating onto traps (like our Economy Red Sphere Trap or Ladd Apple Maggot Trap & Lure, each sold separately) and let it do its work! Female apple maggot flies are attracted to the color red. Before the end of June, once petals have fallen and before fruit is visible, coat a red ball, trap, or even a ripe, red apple with Tangle-Trap Sticky Coating, add a lure (sold separately) and place it in your tree. The females will be drawn to the scent of the lure and the red color. They will land on your trap and get stuck. Tangle-Trap Sticky Coating is a clear formula, so the red color of your trap will remain visible. And the lid has a built-in brush for easy application.